This visit: 2015-9-10. Higher Uppacott longhouse, built circa 650 years ago. Virtually Dartmoor - Interactive Visit to Higher Uppacott. Front view of the original longhouse (it was extended over the years). Note that it slopes - the human accommodation is to the left of the door, the animals' accommodation, i.e. the shippon, is to the right (down the slope, for drainage). The upper end of the house is dug into the ground. Drainage hole at the lower end of the ghouse. General external view of the lower end of the house. The cross passage, the shippon is to the left. To the right is an ashlar wall i.e. of squared granite blocks, expensive, which was added much later - originally the house was not divided. The door nearest the camera is probably the one through which the cattle were brought into the house in the winter. The shippon: a cobbled area in which about a dozen cows were housed to over-winter. There is a central drainage channel that leads out through a hole in the end wall. The opwn window above was probably for throwing out used straw bedding and manure. The area above was thought to have been crossed with tree branches as flooring above which hay was stored. The upper open window was to encourage owls that would keep the mice and rats in check. Another view of the interior of the shippon. Close-up of the cobbles and drainage channel and exit hole. Large fireplace, added later to replace the original central fire hearth stone, from which the smoke simply diffused out through the thatch. Originally, the human accommodation was a simple hall, then a sleeping area was added at the upper end. Later, an extra room was added with another "upstairs" room. The room above the downstairs human accommodation, showing the medieval cruck trusses supporting the roof. Top of the modern stairs, blocked off doorway into the added "parlour" wing and the floor of the adjacent upstairs room above the fireplace. The west side of the roof is of unblackened wheat-reed thatch, the roof timbers are also unblackened, indicating that they were installed after the hearthstone was replaced by the fireplace. Original longhouse (cream coloured) with the mid1600s "parlour" wing (one room up and one room down) to the right, not painted. 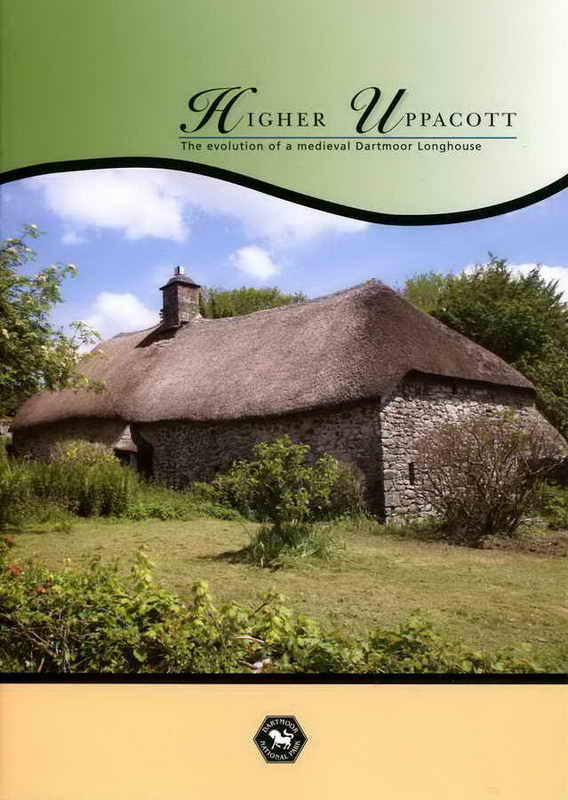 Higher Uppacott - The evolution of a medieval Dartmoor Longhouse. Dartmoor National Park Authority booklet, 2012. �2.50. 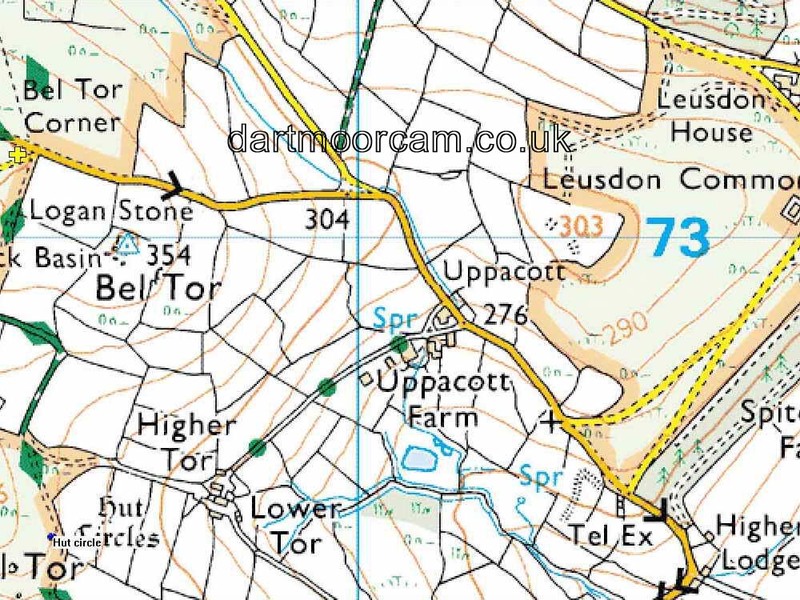 Higher Uppacott is located at SX 7013 7287, about 1 km (0.6 miles) north of Poundsgate and 3.25 km (2 miles) east of Dartmeet. It is only open on advertised days - see the first link at the top of this web page.